PHILADELPHIA, April 21, 2017 /PRNewswire/ -- Chubb today announced its pledge to sponsor the planting of 32,000 trees in 2017 to support the American Forests Global ReLeaf® program. Chubb's sponsorship is the largest by the company since it began supporting the cause in 2008. 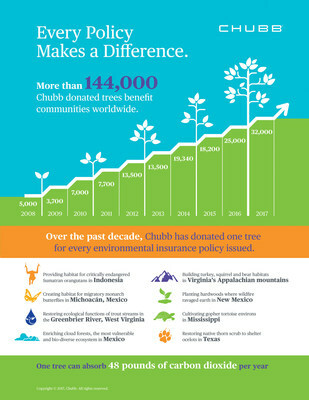 Chubb's pledge represents one tree for each new environmental insurance policy written globally in 2016. "We are honored to celebrate our tenth year supporting American Forests' efforts to transform, rehabilitate and protect our precious global forests," said Craig Richardson, Executive Vice President, Chubb Environmental. "Chubb and its employees remain committed to helping ensure a healthy environment and a balance between sustainable development and preservation." Specifically, Chubb is committed to measuring and reducing greenhouse gas (GHG) emissions from its own operations. Between 2012 and 2015, GHG emissions at Chubb were reduced 5.3 percent per employee, driven by emissions reduction initiatives. This effort is part of a broader global initiative, and Chubb, its employees and its charitable foundations continue to demonstrate their support for a wide range of environmental philanthropies and volunteer activities in local communities around the world. Chubb's charitable foundation grants have helped preserve sensitive lands and habitats, finance green business entrepreneurs, and support educational programs that promote a healthy and sustainable environment in the U.S. and around the world. Mississippi (Biloxi and Black Creek): In cooperation with local partners, American Forests will restore the longleaf pine habitat, a 200-acre area selected because of its diverse wildlife, featuring hundreds of unique plant and animal species. This is the first year of a five-year project, and will focus on woodpecker cavity construction, the hatching and raising of gopher tortoise eggs, and the reforestation of longleaf pine ecosystems with 100,000 seedlings. California (High Sierra Ranger District, Sierra National Forest): The project will span 600 acres and will plant 128,500 seedlings, a mix of ponderosa pine, Jeffrey pine, sugar pine, white fir and red fir. This forest system is reliant on large, healthy forests to regulate the flow of water throughout the year, and this project will help to make a sizeable contribution to watershed restoration in the Sierra Nevada range. Kentucky (Daniel Boone National Forest): Restoring these areas to their former forested balance is complex work. Invasive species must be removed, compacted soils must be ripped, and seedlings must be grown and then planted. In partnership with the U.S. Forest Service, 11,000 trees will be planted across 16 acres including 14 different tree species. Texas (Lower Rio Grande National Wildlife Refuge): American Forests has been working in the Lower Rio Grande Valley since 1997, and has since planted more than two million trees. This work is vital to safeguarding the many unique area species, including the ocelot, a rare cat that numbers fewer than 50 surviving in the U.S. today. West Virginia (Mower Tract, Monongahela National Forest): From 1880 to 1940 almost the entire Mower Tract area was clear-cut, and what wasn't logged suffered from extreme wildfires. This project will jump-start the regrowth of an area that will eventually restore itself after a few hundred years. In 2017, 75,000 trees will be planted across 1,126 acres. Wyoming (Wind River District, Shoshone National Forest): In cooperation with the U.S. Forest Service, more than 40,000 whitebark pines will be planted in Shoshone National Forest, a candidate to be listed under the Endangered Species Act. This is part of the Greater Yellowstone Ecosystem; this 163-acre planting will be year three of a decade-long reforestation project in the region affected by wild fire, blister rust and pine beetles. Panama (Pacific Coast of Panama): The Azuero Peninsula was once verdantly-forested Central American foothills. Although it has been inhabited by humans for more than 12,000 years, it was not until recently that clear-cutting for cattle ranching made a big impact upon the landscape. Now less than 7 percent of the land is forested, and the local wildlife – like the Azuero spider monkey – has suffered. American Forests is working with local partners in Panama to plant 4,500 trees in a biological corridor stretching 75 miles and spanning more than 60,000 acres. Indonesia (Batang Toru Forest): The Batang Toru Forest in North Sumatra, Indonesia, is internationally recognized as critical habitat for the endangered orangutan, and the forest has been steadily encroached upon by a number of harmful factors such as urbanization and illegal logging. American Forests is working with local partners to plant 28,500 trees across 114 acres in an effort to address multiple environmental concerns while also engaging and educating local communities. Founded in 1875, American Forests protects and restores urban and rural forests and is the oldest national nonprofit conservation organization in the country, serving as a catalyst for many of the most important milestones in the conservation movement. With a goal of planting more than two million trees in 2017 alone, American Forests has planted more than 50 million trees since 1990 — in all 50 states and in nearly 50 countries worldwide. Chubb Environmental is among the largest and most advanced global underwriters of environmental liabilities and pollution risk, and develops insurance products and risk management services that facilitate market-based solutions to current and pending environmental issues. In the U.S., Chubb is a leader in meeting the insurance and risk engineering needs of clean technology companies including renewable and alternative energy providers, manufacturers, and software and hardware companies.